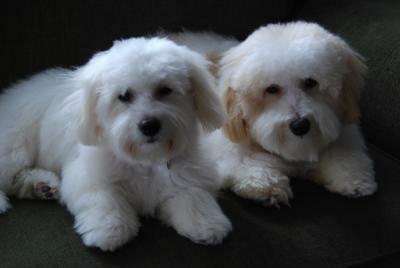 I love it, they look so cute and are much easier to keep groomed. They are just so cute. Jonah has not had a hair cut in 3 yrs. Soon thou he will be sporting the puppy cut to give him a fresh coat for the Az. spring. FENWAY AND RILEY YOU TWO ARE SIMPLY ADORABLE!!!! IF SHE SAW YOU. JUST TOOO CUTE! Fenway (left) looks JUST like my Gracie. FENWAY AND RILEY, YOU ARE SO CUTE WITH YOUR PUPPY CUTS....REGARDS FROM KATHY AND TRISCUIT FROM PA....ORIGINALLY FROM OLD LYME, CT.